Food allergy awareness reached new heights at our screening of Rotten: "The Peanut Problem." 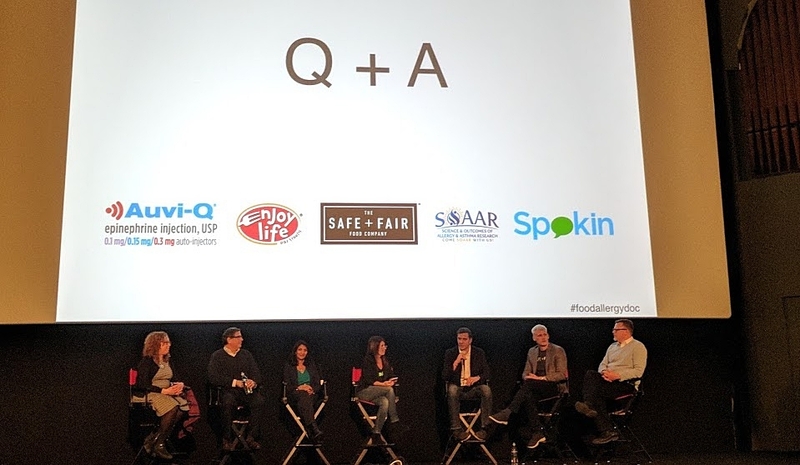 The Davis Theater in Chicago was packed with food allergy families, allergists, researchers, members of the Illinois Restaurant Association, friends from our favorite food brands, and other friends in food allergy community — all coming together to celebrate the opportunity for increased awareness that the Netflix platform offers. We could not be more grateful to our co-hosts, AUVI-Q (epinephrine injection, USP), Enjoy Life Foods, and Safe + Fair. For those who weren't able to make it to the event, we've rounded up some of the highlights from our Q&A with Ruchi Gupta (featured in the documentary, director of SOAAR), Eric Edwards, MD, PhD (Co-founder of AUVI-Q), Will Holsworth (CEO of The Safe + Fair Food Company ), Aaron Donnell, MD (Allergist at Chicago Family Allergy and Asthma), Joel Warady (Chief Marketing Officer, Enjoy Life Foods), and Mary Tobin, MD (Allergist at Rush University Medical Center). What was your reaction to the documentary? Eric Edwards: As a patient with life threatening food allergies, a doctor, a parent of children with life threatening allergies, and someone who has experienced anaphylaxis himself, I know that even a decade ago we did not have this level of awareness. If people see elements of this documentary as controversial, keep in mind that the conversation wouldn’t even exist without it. Hopefully this is going to create awareness for individuals who have little knowledge or information about the challenges we face as patients and clinicians. Will Holsworth: Netflix is such an important platform, so I think this is a huge step forward in the conversation. Netflix has decided to expose the issue of food allergies like never before. I know there are a lot of conversations about things people liked or didn’t like, but the fact that Netflix has chosen to address food allergies is beneficial to all of us and addresses an important need. This is a really big day for the community. Aaron Donnell: Even if there are things to criticize about the details or what’s missing, I’m just happy that it’s raising awareness on a big stage with so many people. They addressed so many issues, like with the restaurant industry, the documentary makes it so real and relatable. I like the challenge to restaurants that they should accept food allergies as part of the industry. Ruchi Gupta: When I got involved with Netflix, they said they wanted to come talk to understand the public health impact. I answered all of their questions, then I asked, are you interviewing any families? And they said they weren’t planning on it. And literally within 24 hours, I must have called 20 families — all these amazing kids and parents came with less than a 24 hour notice. All I wanted was their voices to be heard. I think when you hear them, you really get what this is all about. There are flaws with the episode — it’s dramatic, it’s sensational — that’s Netflix. But it’s building awareness for the topic and all of us that are affected by it and live it every day of our lives, we know how real it is. Joel Warady: When we started the business [Enjoy Life Foods] 17 years ago, no one knew what we were talking about. We were free of the Top 8 from day one, and we'd go into the supermarkets and talk to the buyers and they didn’t understand how prevalent food allergies were or were going to be. I am very excited that this is raising awareness for food allergies. One of our missions, in addition to creating products that are safe for all people with food allergies, is to help the food industry understand how important this is and to be advocates on your behalf. Mary Tobin: I really appreciated the stories with the families and how each of the kids were effected. We’ve come a long way. I think about how far all the amazing parents have come and how hard the parents have worked to increase the education. I really think this is a fabulous project — we’re talking about tolerance and how are we going to restore our guts so they are healthy and can move us toward health. Looking at the hope in those kids faces who can eat those cupcakes again — that’s what we want for everyone, and we’re so close. What is the one thing you learned from Rotten that you can apply to your daily life or your profession? Susie Hultquist: There's a lot of work left to do in the restaurant industry, which is why I am committed to making it easier globally to eat out with food allergies. It is one of the top requests for the app that we get from people. They just want to go to another city like Boston, LA, or London, and find safe restaurants. It's an enjoyable part of life, and it has been too hard. So I am committed to restaurants like Carbon Arc Bar & Board here in the Davis, to chefs like Tony Priolo at Piccolo Sogno, and give them recognition through our app. We are asking people to do the same and give kudos by recommending restaurants that made them feel safe. Spokin plans to aggregate that information to raise that standard of care to a level that has never been done before. There are so many of us — we can not only help people, but we can actually save lives. Ruchi Gupta: As much as the restaurant industry is difficult, we just went on vacation and every restaurant we went to asked if there was an allergy that we should be aware of, and that was shocking to me because just that intro is all we need to show that they care. To get that into the culture is just amazing. I was just at the Gordon Research Conference this week with top researchers from around the country, and we were discussing all of this. It’s amazing to see how many researchers are in this field compared to 10 years ago and how many people in the research world are committed to it. Hopefully next time they make a documentary, we’ll have so much more to say than we do now — that’s our goal and our mission.